As the Founder and CEO of Profiles, Inc., Amy Elias is working to change the fate of Baltimore. Over the past 27 years, she’s focused on clients and issues that make positive change for the city. From the re-opening of the city’s iconic and historic Lord Baltimore hotel, to the launching of the ProjectSPACE program aimed at increasing on-street parking options for people with disabilities, to the introduction of the Inner Harbor’s internationally recognized water wheel, Elias is a true Baltimore advocate. She opened Profiles in 1990 and has grown the public relations firm from a one-person shop to a 10-person full-service agency with a roster of more than 40 clients. Through Elias’ leadership, the firm works with clients that attract more visitors to the city, enhance learning opportunities, increase public program awareness or bring jobs to residents. Top clients include CareFirst BlueCross BlueShield, Waterfront Partnership of Baltimore, Kennedy Krieger Institute, Baltimore magazine, and the National Aquarium. “A Baltimore native, Amy has remained committed to Baltimore and continues to serve as one of the city’s advocates. Her conscience is the compass that guides her work. 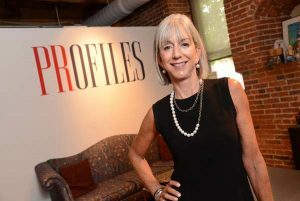 Not only does she dedicate a great deal of time and energy to projects of civic and social importance, she only works with clients whose work she feels passionate about,” says Jamie Watt Arnold, senior vice president at Profiles. Elias serves on the boards for Baltimore Museum of Art, Center Stage, and Sinai Hospital. She has been recognized in The Daily Record’s Top 100 Women, Influential Marylanders and Most Admired CEOs awards. She believes mentoring is important. Younger people, she says, look at issues and opportunities differently, which gives a different perspective and often a more effective outcome. “Young people bring a level of energy and creativity that is infectious,” Elias says.